I can’t wait to “see” you on Wednesday, February 13 at 8pm ET (9pm AT/7pm CT/6pm MT/5pm PT). You will receive an email asking you to confirm your R.S.V.P. – please click that link and you’ll be all set. May I make a suggestion? Take a moment to mark your calendar now – I know you are busy taking care of everyone and everything else; this time is for you! 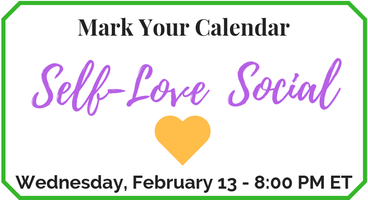 You will receive emails from me with information on how to prepare for the Self-Love Social and how to join the fun on February 13. Trust me – you don’t need to do anything special other than bring yourself (and you are very special!). However, I’ve learned a few things about how to get the most out of virtual workshops and I’ll share them with you prior to the Self-Love Social.